I always promised Dave Richardson an article on my VW Type 4 engine. Then he made me editor, so here it is Dave! During my first Tandem Wing Fly-in at Ottawa in 1994, I was naive and looking for an engine for my Dragonfly project. 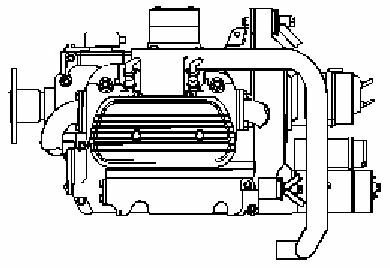 Steve Bennett of Great Plains Aircraft Supply spoke and he made mention of VW Type 4 (T4) engine as an alternative to the VW Type one (T1) engine. It had a stronger aluminum case and could be build up to 90+ HP on a small budget. I was hooked. Steve Bennett just so happens to live in Omaha where I reside, and I quickly found him out to become his next best friend. You see, I didn't take auto mechanics in high school and didn't know the terminology let alone how to tear down and put back together an "easy to work on" engine. Like I said, I was naive. 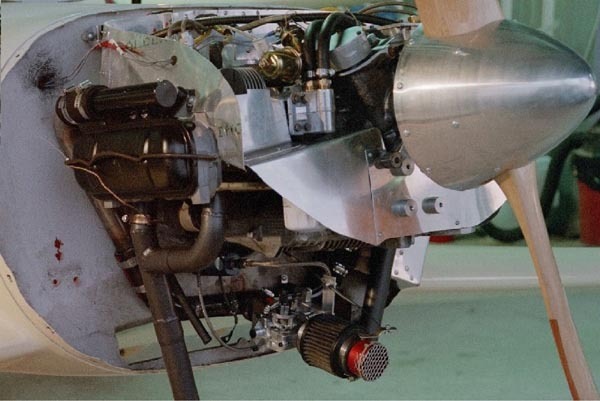 Fitting the T4 engine in the same space where once a RevMaster T1 hung, was relatively easy. The heads are larger so there are some items to be done on the pilot side to get it to fit under the Q2 cowling. The wire valve cover retainer must go. To hold the valve cover in place, I cut 2 hose clamps in half and mounted them with screws to existing holes on the heads. The two halves then come together to retain the valve cover. See picture below for visual detail. The front of the valve cover rubbed the cowling and prevented the cowling to fit. I used a hammer to dent the front of the valve cover enough for the cowling to fit. I was trying to use an existing cowling and if you have not fit the cowling yet, a builder could avoid the denting process. The other item that I had to do to get the engine to fit under the existing cowl was to reduce the height of the intake manifold. I used the standard Great Plains Type 4 manifold but had to cut & re-weld them to minimize their height. This significantly reduces the ability to tighten the attach nuts and I had to trim the studs to get everything to fit. I did the same to the passenger side, but I would not if I doing it over, as it is not necessary. Fitting the baffling was the most baffling. It took several weeks to figure out what to do and how the shaping of the aluminum should be done. Again, trying to use an existing cowling with existing cooling holes (a smiley face inlet) made the job more difficult. 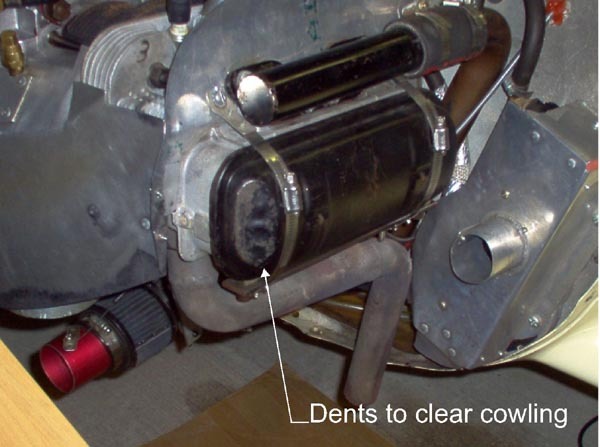 I believe using a new cowl and repositioning the inlet holes would make a more efficient cooling system. Once the installation was complete and I started flying behind this engine, I was pleased with its performance. I was seeing 1000 FPM climb at 115 mph indicated and was cruising at 158 mph indicated at 23" of manifold pressure. My vacuum gauge needle was bouncing and I was told it was probably due to an intake leak. We checked for leaks and couldn't find any. After some research, we found that the Type 4 lifter springs were stiffer than the Type 1 springs. Steve made a call to his head shop and they used the springs that they use on Type 1 heads. So, we went on a search for Type 4 lifter springs. They weren't easy to find, but we found them and we switched springs. This did nothing to solve my bouncing vacuum needle, but that's when I started having noisy hydraulic lifters. I also found the retaining clip on the #4 exhaust lifter would be bent and come out. Apparently the lifter was bleed down and was not pumping up quickly after start up. This caused two very anxious flights. Just after take off on both flights I lost power and had a noisy engine like a hydraulic lifter or lifters weren't pumped up. I made it back to the field but nothing I did fixed the lifter issue. I had to replace the #4 exhaust lifter three times due to the bent retaining clip. No, they don't just sell the retaining clips! I had a leaky front seal that I wanted to fix. So I got Steve to come out and help me remove the prop hub and replace the front seal. This event had a profound effect on what was to occur ten hours later. But more on that later. While we were at it, I had Steve help me put the original lifter springs back in the heads because I did not have lifter issues before we replaced them. Everything seemed fine after this work was done. I did still have some lifter issues, but they seem to be manageable if you warm the engine up. I have also found that my engine may come to a stop with the #4 exhaust valve open. I try to rotate the propeller one half turn after a flight to close that valve and take the pressure off the lifter in hopes it will not bleed down. After all this, my vacuum gauge needle still bounced. I decided to switch to a manifold pressure gauge as this was a more conventional power setting device in an airplane. While reading the installation instructions for this instrument, it stated that if the needle bounced, it may be caused by having a too large of opening in the feed from the intake system. A thought occurred to me after I read this and I reach under the panel while the engine was running and squeezed the soft rubber tube feeding the manifold pressure gauge and the needle stopped bouncing. I simply put a cable tie around the rubber tube and pinched it till the needle was steady. Boy, I went a long distance for that resolution. At this point in my flying, I was starting to stretch my wings and went to my first Fly-in in Yankton SD. After the fly-in I flew to Norfork NE to help the ground crew fly some young eagles. After I returned home I had logged about 3 hours that day. That was a Sunday, two weeks before Ottawa 2002. The following Wednesday I had my A&P out to sign my log book for my annual condition inspection. The inspection went fine and soon I had the necessary signature and away went my friendly A&P I had 2 hours to go before I needed to change the oil and was fussing with myself about whether I should change it while the cowl was off, or try to fly that coming weekend. Someone was looking out for me, as I chose to change the oil. Once the oil was changed I started the engine to check for leaks. The engine ran rough like the hydraulic lifters were empty. I ran the engine for a while to let the engine warm up in hopes that the lifters would fill up. After awhile I shut the engine down and went to air the tires up. Then I restarted the engine. It ran smooth this time and I was about to shut down and put it away when I decided to make sure it would run smooth at full throttle. That's when I got the shock of my life. I went to full throttle and then all of a sudden the engine over rev'ed, so I pulled back the throttle and looked up to say to myself, "I don't think I have a prop any more".